You can set the system's date. 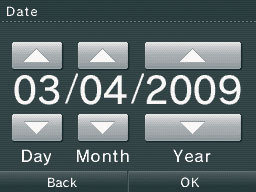 Some games may use the date feature, so it is recommended that you enter the correct date. On the System Settings Menu, go to page 2, then select "DATE." Tap the up/down arrows to change the date, then select "OK" to confirm.